We enter January with the final ‘badger line-up, the only thing that’s really changed is that Phil has started to bring a guitar along. Sadly the weather took a turn for the worse and thick snow fell on the 3rd of Feb so we pulled out of the gig. We finished the end of 2007 recruiting a new bass player, after Phil F decided he just couldn’t find the time any more, back to our familiar haunt of Forming Bands we met Keith. We wasted no time getting Keith up to speed adding some funk from Keith’s slap bass stylings to some of the original tunes, and crafted a new one called “The Dentist” a lovely song about pervy dentists. We actually had Prey played on BBC 3 Counties radio – Quite a cool moment, we heard them play it live whilst we were at London Road Studios in the middle of a rehearsal! With some new songs ready to go, we got our first gig booked for Club 85, the poster this time was inspired from the “The Man Who Eats Badgers and Other Strange Tales from Bodmin Moor” Arthur Boyt. This also made it as a t-shirt design (not that anyone bought one). The gig went well (we got invited back later, so it can’t have been that bad!). The lineup remains the same, for now anyway! I don’t remember exactly what we did at the start of the year, but in February I put together the Badgercaster, basically my already mutilated SQ Series Squire (if you know what these are, I’m sorry) got changed to a one pickup rock machine with a built in homemade Fuzz Factory clone pedal. In truth I only used it live a coupe of times, mainly to end a set with some serious noise before ‘Strange Case’. Moving along to the 13th of March, we played the first heat of a Battle Of The Bands competition at the Horn Reborn in St. Albans, this was the first gig where I thought people actually ‘got us’, people we didn’t know were getting into our music, in the video you can see some people head banging along, nice! This was the gig we debuted Stop The Bells, which seemed to be well received. I’d even made up a couple of specific logos for that and Iron Clad, for the MySpace MP3 player I believe. We actually won the heat (they announced this around 1 am whilst we were loading up our cars). We then had to perform in the semi-finals, but more on that later. In parallel we were recording our second E.P, not sure what inspired it, but I came up with ‘Undercover Death Funk’, I think I was trying to start my own genre. Once we had the songs tight, we decided to record an E.P, so we’d have something half decent to hand out to to promoters / get gigs. We recorded the album in Offley Village hall, using a guy I met on the Muse forum (Gareth)! I took these photos, so that’s why I’m not featured at all ? 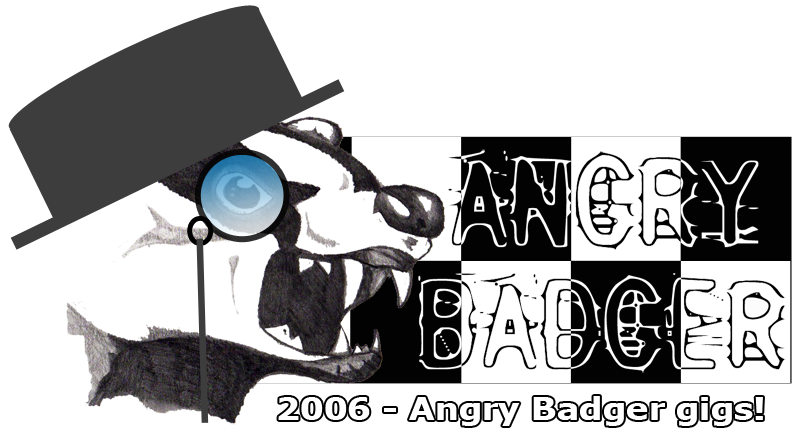 My first band and longest serving one so far was Angry Badger. For no other reason than I have lots of MP3’s, pictures and some videos, I thought I’d document the history of the ‘badger. Originally started by myself, a mad unreliable punk drummer called Dan and a guy from works brother called Egor some point in late 2004, we were initially nameless, toying with all sorts of names, including the Dead Zebra’s (just imagine the logo!). We recruited another guy from work to sing for a while called Tristan, but he was more doing it to stop us from keeping on at him, we played some covers (badly) just for fun, myself and Egor regularly swapping guitar and bass duty’s depending on the song (I could play slap bass, Egor was better at guitar solo’s!). Dan became increasingly unreliable, so we recruited for a drummer online and met a fantastic player (who’d even played in front of Chad Smith at drum school) called Adam. Once Adam was recruited, we needed to find a permanent singer, who could sing more than Green Day covers.